It’s a normal cold January morning and I am on my way to work and suddenly I feel queasy, my head is spinning and I struggle to my desk. I think to myself ‘oh no, this must be morning sickness’….well I wish that this was all I had to deal with! Two weeks later and I was not in a good place, I was being sick at least six times a day. I was struggling to cope with not only going to work, but trying to keep it all a secret until my twelve week scan…this was a challenge!! When the secret was out, I was at my worse point and it was showing no sign of getting any better. When I told my manager at the time, she told me to eat ginger biscuits because it stopped her feeling sick, not a very sympathetic manager…oh and by the way don’t you think I’ve tried that, along with everything they recommend with help ease it!!!! Luckily by sixteen weeks, it started to ease off and then finally stopped. It was totally worth it to have my baby girl in my arms at the end…..so worth it, that I did it all again! Alice was fifthteen months old when I was blessed to be pregnant again. This time the sickness started within a couple of weeks of finding out I was expecting…let round two commence! I didn’t think it could be possible, but my sickness went to another level this time. It got to the point where I couldn’t even keep water down,so I had a trip to the doctors to get the anti-sickness tablets. Even with the tablets I was being sick up to ten times a day. I now had a different job, with a different company and I am pleased to say that my lovely manager was a lot more empathetic towards me. I believe she would always have been nice about it, but also, since my pregnancy with Alice, the Duchess of Cambridge had given birth to Prince George and Kate (can I call her Kate?!?) had suffered terribly and ended up in hospital with her sickness. This massively raised the awareness of how bad sickness in pregnancy can be for some woman, people were talking about it and sharing their own experiences more openly. 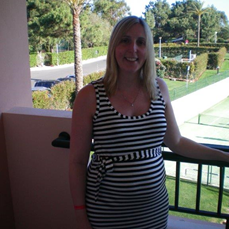 I wasn’t able to keep my pregnancy a secret until my scan this time, running to the bathroom all the time, does give the game away…..my manager said to be ‘Shall we just call you Kate?’ Everyone knew about the condition I had, thanks to Kate. My sickness stayed for longer this time and two days after it finally stopped I was in agony, I thought I had put my back out. I went to see an osteopath and was shocked to find out that I had put four ribs out, this was all because of how much I had been sick…..then he had to pop them back in!! It’s strange looking back at this, at the time it was a really difficult, dealing with the sickness and looking after Alice who would spend a lot of time sitting in the bathroom with me playing with her toys. But, you really do forget about it all when you get to hold your baby for the first time. 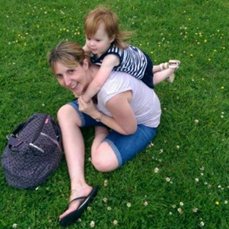 I would do it all again to have my two gorgeous girls…. The funniest thing that happened during this time, was when Alice was seventeen months old and got a sickness bug. She ran to the bathroom to be sick, all that time watching mummy, she knew what to do….love her! More like all day all night sickness!! I really feel for you – I suffered awfully with my pregnancy and was sick pretty much the whole way through, although I never got to the point where I put a rib out – poor you! It’s what has put me off getting pregnant again, but your second pregnancy (although obviously not an easy time at all) reassured me a little bit that you can get through it if you have to. I can’t imagine how debilitating it must have been to need to vomit all the time, just feeling on the brink of it wears me out! *Must keep eye on prize, must keep eye on prize, must keep eye on prize…* Glad you had sensitive colleagues.